With the introduction of the National Anti-Corruption System in Mexico, companies in Mexico are now encouraged to fully observe better practices to aid in the combat against the never-ending dilemma in Mexican daily life: corruption. Since the publication of the General Law of the Anti-Corruption System (GLACS)1 on July 18, 2016, Mexico took a major step towards its journey of repealing the epidemic of corruption that has long been an ailment in all the relevant areas of politics and social and economic development. This new legislation’s intention is to establish a basis for coordination between all levels of government (federal, state and local) which allows authorities to prevent, investigate and punish corrupt practices. On that same date, additionally, the General Law of Administrative Responsibilities (GLAR)2 was published. This law’s purpose is to establish administrative responsibilities for public officials, their obligations and applicable sanctions for any corrupt practices in which they might incur. Nevertheless, the interesting thing about the GLAR is that it does not establish obligations or sanctions exclusively for public officials; it also encourages companies in Mexico to observe best practices in combating corruption through the adoption of certain specific measures. But the question arises, how can a company begin to fulfill the expectations set upon it through this piece of legislation? To answer this question, we must first look at GLAR’s article 21. This means that companies can turn to the Federal Government to receive assistance in complying with the GLAR’s provisions, but can also develop themselves fully functional programs and controls without the Government’s intervention, provided that these programs and controls achieve the goal of creating an ethical environment within the company. An important thing to always have in mind is the provision contained in article 24. According to article 24, companies will be punished when any of their officers, agents or authorized representatives incur serious administrative offenses with the intention of obtaining benefits for the company. In other words, liability may not be avoided by the company for acts of its agents, officers or authorized representatives. However, notice that the article clearly intends to punish corrupt activities done by individuals for the benefit of a company. Certainly, then, for liability to arise the acting individual must have the intention to bring about a benefit the company. But, what happens when the individual seeks only to obtain personal benefit and not for the company? Certainly, GLAR does not provide for this scenario, but its legislative intent seems clear enough to infer that a company may not be liable for its agents’ acts when done for personal benefit. At this point, you might be wondering “if a company can now be somehow liable for corrupt practices and it also has a duty to take extra measures to avoid unethical behavior within its organization, how exactly does the Federal Government expect the company to undertake this important duty?” The answer to this question lies within the text of GLAR’s article 25. These elements will become a “must have” in every company, especially in those seeking to participate in public biddings, since they are more prone to incur in some form of administrative offense. The reason for their need is because authorities, during the process of investigating administrative offenses, will view any company that complies with them in a more favorable manner as compared to a company that does not meet any of these elements. Now, as attractive as this may sound, GLAR only provides us with a general catalog for compliance with anti-corruption efforts; there is no indication whatsoever within that law as to any guidelines to help develop these elements fully. 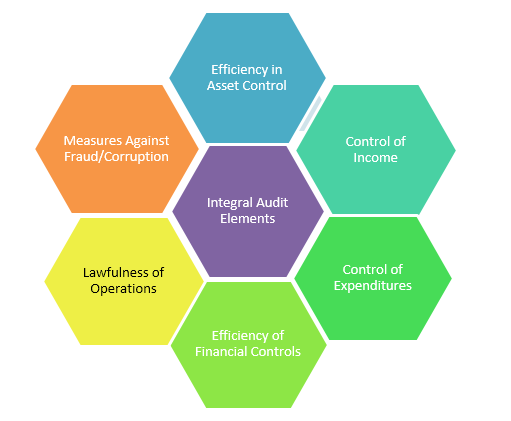 For that matter, the SPF has published what is known as the Model Program for Business Integrity (MPBI)3. The MPBI establishes general guidelines and specific recommendations for companies that are underway in adopting ethical and anti-corruption measures within their organization. These guidelines provide us with a more complete description of the key points to be included in each of the elements that compose a company’s Integrity Policy. A company’s M.O.P. must be clear and complete and should define tasks and responsibilities within each of its internal areas. It should also specify how the “chain of command” and leadership is structured. In other words, the company must have a clear picture of its internal corporate governance, as well as how its day-to-day operations are run in order to produce a suitable manual. In the case of large companies, it is highly recommended that, in addition to the C.C., each area has its own protocols to protect integrity. Such protocols may refer to appropriate measures in dealing with public officials, suppliers, investors, clients or any other group with whom corrupt practices may take place. These systems must constantly examine compliance with integrity standards within the company. Although the S.A.C.S. is intended to be more of a financial control tool for the company, it is important to point out some essential areas to monitor constantly. It is highly recommended that special attention be given to areas such as sales, human resources, public relations, marketing and purchases. 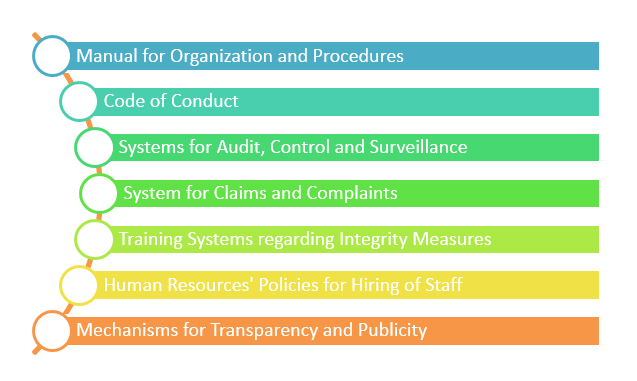 These areas are more vulnerable to engage in corrupt practices given their continued contact with people outside the organization. Therefore, we cannot stop encouraging managers to place important levels of attention to areas such as these. These systems must include disciplinary actions and clear consequences to those who act in a manner contrary to internal norms or Mexican law. Regarding claims, these are not to be limited to the internal setting of the company; the organization must provide means to allow any claim to be communicated to competent authorities outside the company. For this matter, it is important that the company establishes appropriate channels to file claims or complaints, such as a hotline for clients or employees, a special e-mail for complaints, an online help service, etc. Whichever channel is established, it is important that policies for follow-up, resolution and counseling are also provided within that channel. The company must provide its employees with the appropriate training related to the C.C., Mexican and international legislation pertaining anti-corruption and the company’s Integrity Policy. The intention of this element is to guide a company’s human resources department in hiring people who will be more likely to abide by its Integrity Policy. In other words, it is in the company’s interest to avoid hiring people who may put its integrity at risk. However, extreme care must be taken in these policies. They can never be aimed at discriminating individuals based on ethnicity, age, disabilities, status, health, religion, political opinion, gender, sexual orientation or any other that may be construed as an attack to human dignity. The company must make its best efforts to ensure its Integrity Policy available to the public, to investors, suppliers, vendors and other stakeholders. Compliance with these elements, as stated earlier, will help the company get a more favorable treatment if it is involved in an investigation procedure for alleged corrupt practices by any of its officers or authorized agents. Therefore, it is highly recommended (if not imperative) that every company that does or wishes to do business in Mexico abide by the laws, rules and guidelines provided by the Mexican Government. Mr. Duran is a Mexican-American attorney licensed to practice nationwide in Mexico. Born in Chula Vista, California, Mr. Duran completed his legal studies on December of 2014 at the Universidad Autónoma de Baja California (U.A.B.C.) in the city of Mexicali, graduating with honors. His professional experience includes working as a Jr. Associate in the firm Bryan, Gonzalez Vargas & Gonzalez Baz, S.C., where he was involved in numerous cross-border transactions, predominantly with U.S. corporations doing business in Mexico and overseeing corporate transactions such as formation of companies and contract negotiations. His good performance led him to become a part of Deloitte's legal division as a consultant, where he gained experience overseeing complex corporate transaction such as M&A, asset sales, corporate restructuring, divestitures and spin-offs.